GANJAM, India (AlertNet) – Efforts to secure land ownership for tribal people in one of India’s poorest states are bolstering their economic security in the face of climate-induced hardships, and helping conserve farmland and forest. In the hamlet of Kharibandh in Ganjam, a coastal district in the eastern state of Orissa (now officially called Odisha), 13 households of the Sabar tribal community each received title to 400 square metres (0.1 acres) of government land two years ago. The families had lived in Kharibandh for three generations, but had no legal right to the land. 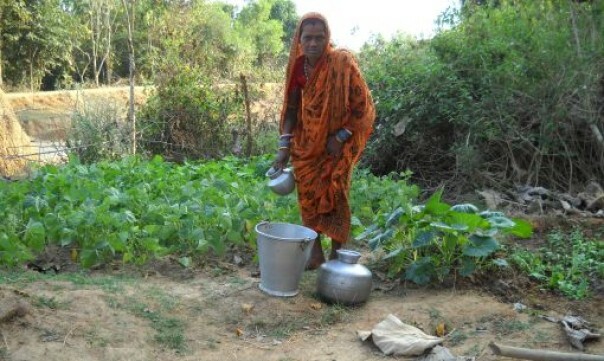 Today, Rabibari Sabar, a 51-year-old widow, pedals vigorously on a foot pump to pipe pond water into her plot of seasonal vegetables interspersed with coconut and papaya trees. As well as feeding her family, she earned 1,500 rupees ($30) last year selling tubers and spinach from her homestead farm to neighbouring villagers. The RDI helped tribal families in Kharibandh apply for their plots under the Orissa government’s Vasundhara (“possessor of wealth”) scheme for distributing land to landless rural families. Tribal people make up about 22 percent of the state’s population, nearly three times the national average. More than four out of five of Orissa’s inhabitants live in rural areas, with the majority earning a livelihood from small-scale agriculture. The occurrence of droughts and floods in the state has almost doubled since 1999, and their intensity has increased – a trend experts believe is driven by climate change. Farmers who were already struggling have been hit hard by the extreme weather. “In 2010, some paddy had been harvested and left in the field to dry while the rest was being cut, when unexpected rains in October flooded this region for eight days, and swept away the season’s entire produce,” says Binaya Kumar Das, a revenue official who settles land titles in the area. Sanjoy Patnaik, RDI’s director in Orissa, underscores the economic vulnerability of farmers who do not own their land. “(With) farmland leasing being banned under Orissa’s land laws, sharecroppers have no buffer against climate contingencies – the owner gets all the compensation,” says Patnaik. But in cases where former sharecroppers have title to their land, “these farmers now get cash compensation of Rs 8,000 to 10,000 ($160-200) for each seasonal crop loss (and) that is happening almost every year now – a crucial benefit they could not access previously,” says Das, the revenue official who deals with land titles. When crops fail and sharecropper farmers have little choice but to borrow cash to feed their families and restart production, interest rates on loans, even from relatives, can be as high as 36 percent annually, while money lenders charge even more. Land titles, however, enable farmers to take out loans from state-run banks with much lower interest rates, Das said. In Chilipoi village, 20 km from Kharibandh, 39 households of the Sauntia tribal community displaced by a dam project 38 years ago had their applications for homestead land approved in 2010. Their one-hectare farmland titles are in the final stages of being processed. Chilipoi suffers from chronic water shortages because of its position on slightly raised ground. “It’s tough to pull up water (from) 20 feet below and carry buckets from the two wells to vegetable gardens and paddy farms farther away,” complains 65-year-old Arakhita Pradhan. But the farmers’ land ownership papers will make them eligible for a 50 percent government subsidy on a bore well, Das said. And a third of Chilipoi’s households have already moved from mud huts into safer concrete homes, which they are entitled to as landowners under a federal housing scheme for the rural poor. While Orissa’s economy has grown nearly 10 percent annually over the past five years, the benefits have not reached everyone. Monthly per capita expenditure, an important indicator of poverty, is Rs 551 ($11), among the lowest in the country, according to government statistics. But land ownership could help change that. In the past, most men in Kharibandh migrated to Mumbai for six months of the year to find construction work. Today, just two villagers are working in the city temporarily. And as families stay together, their children’s school attendance is increasing too. “The rural poor have more at stake in their farmland when they own it – an emotional attachment that holds them back from migrating,” says Kailash Chandra Dash, executive director of the Regional Centre for Development Cooperation (RCDC), an NGO that works on climate change and land rights. Rabibari Sabar’s son, for example, now earns Rs 3,000 ($60) per month as a school teacher in a nearby village, thanks to the land title that acknowledges his tribal status and gave him access to jobs reserved for tribal community members. His mother, meanwhile, has invested in her garden. Apart from spending two hours a day tending crops, the village women have formed self-help collectives to produce organic fertiliser by putting vegetable peelings into pots containing earthworms. “Where farmers do contract farming, loading the soil with chemical fertilisers to maximise output is common. But when they own the land, practices are much more sustainable,” says RCDC’s Dash. There are also hopes that obtaining land titles for communities living on forest land could improve their lives and management of that resource as well. In western Orissa’s Bolangir district, collectives of indigenous peoples are developing a forest conservation project they hope will ultimately generate income under the U.N. Reducing Emissions from Deforestation and Forest Degradation (REDD+) scheme, which aims to create a financial value for the carbon stored in forests. The Orissa pilot programme covers 10,000 hectares (25,000 acres) of forest, including 33 villages and 15,000 tribal people. According to Ghasiram Panda, who is overseeing the project for RCDC, 31 of the 33 villages have been working with government agencies for more than 10 years to preserve their forests. They are now seeking legal ownership of the land under a 2006 law relating to the land rights of forest-dwelling communities. Panda is cautiously optimistic about the project’s prospects of generating revenue from the sale of carbon credits. “Our programme is community-centric, to help forest communities to manage forests sustainably, grow biomass and preserve biodiversity (such as) endemic, rare species and thereby derive more non-timber forest products,” says Panda. “These activities will automatically develop a more substantial carbon sink; income from sequestering carbon would be a co-benefit,” he adds. India’s REDD+ framework is still evolving, and RCDC is working with Plan Vivo, a UK-based non-profit organisation that will assess the project and may award credits according to the amount of carbon emissions it reduces. “If villagers can claim ownership, collectively and individually, over surrounding forest resources, they will have a greater incentive to protect, preserve and use the resources in the most optimum manner. We will see reforestation, not deforestation,” says Barun Mitra, director of Liberty Institute, a property rights think tank in New Delhi. “After all, people (will) not kill the goose that lays the golden egg,” Mitra said.